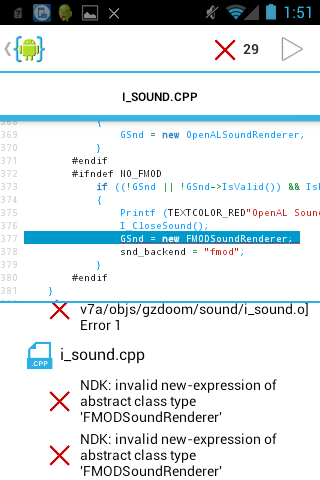 I'm trying to compile an older version of GZDoom from the maint1.9 branch (because I like trying my hand at codeing) but, I keep getting an error in i_sound.cpp saying. 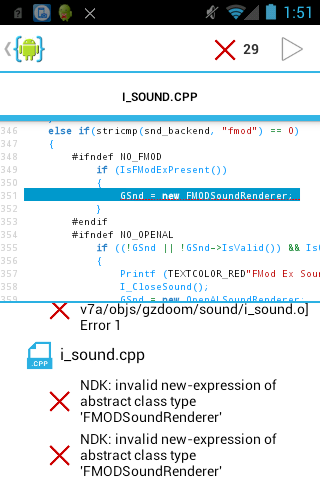 "invalid new-expression of abstract class type 'FMODSoundRenderer' "
Which compiler? Why don't you try to compile ZDoom32 instead? Do you have the FMOD headers installed? Yeah I've got FMOD_studio installed. That'd be the problem; the versions of GZDoom that used FMOD aren't compatible with FMOD Studio and need a specific older version of FMOD Ex. For whatever reason, the FMOD people didn't make Studio backwards-compatible. 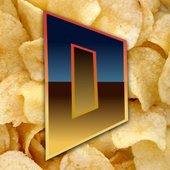 Or try compiling a newer version of GZDoom that supports OpenAL.